The sounds of basketball dribbling and shots of encouragement signaled a new basketball season for the South Women’s basketball team. With the hopes of improving on a dismal prior season, things began a bit confused for the players. For the third consecutive year, the team would have a different head coach. 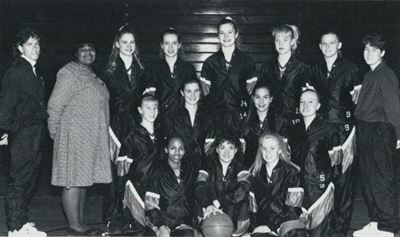 Debbie Kern led the Tigers, with help from her assistant coaches R. Keefe, B. Deene, J., Freeberg and B. Rouston. The team started off where they left of last year, losing their first two games. Losses to Roosevelt, 65-37, and Henry, 48-37, could have ended the season and the enthusiasm the players had. But Coach Kern and her staff would not let that happen. The Tigers reeled off four consecutive conference wins, getting themselves back in the race. They beat Washburn 41-32, Edison 49-31, North 55-52 and Southwest 62-42. A minor setback occurred when the team lost to perennial power Roosevelt, 57-40. The team bounced back against eventual co-champion Henry. Remembering the first game loss to the Patriots, the Tiger came out ready to play their best game and won 54-39. After the game, Roosevelt and Henry were tied for first place. South was only one game behind in the standings. South won against Washburn, 73-32, and Edison 53-30. North, who the Tigers beat in a close game the first time, was the next conference opponent. The Polars were one game behind South, looking to move up in the standings. Another close game was played. The teams fought for every point. Unfortunately for the Tigers, South came up just a little bit short, losing 42-27. With one game left, there was a two-way tie for first place (Henry and Roosevelt) and a two-way tie for third place (North and South). A loss in the last game could push the Tigers to fourth place. South ended the season with Southwest and the Tigers too nothing for granted. South stormed ahead and won 60-32. Now, the only question was did they have to share third place. New came to the team that North also won, beating Edison 58-40. Results for the JV team are incomplete. They reported a 5-2 conference record, but scores from five games were not reported.